I want something just like this! BREAKING NEWS: Palace Place achieves another historic record price! I have written to proudly announce that I have set another historic record price at Palace Place by having just sold Suite 3805 for $860,000 by having represented the sellers and buyers. The last sale price for a high-floor 05 suite was $620,000. These marketing efforts have left me with several more buyers looking for large Palace Place suites! In fact, they are ready to pay even more given the recognized value proposition Palace Place represents. If you have a large Palace Place suite, please call me ASAP! Do the math! This sale price of $576 per square foot is a bargain when new, inferior construction is charging up to $1,000 per square foot. Furthermore, this suite size in the downtown core would easily fetch $2,000 per square foot or more. Why buy the K-car when you can own the Mercedes-Benz? Finally! After 3-years of waiting! 1 of only 16 of the most sought-after suites at Palace Place! 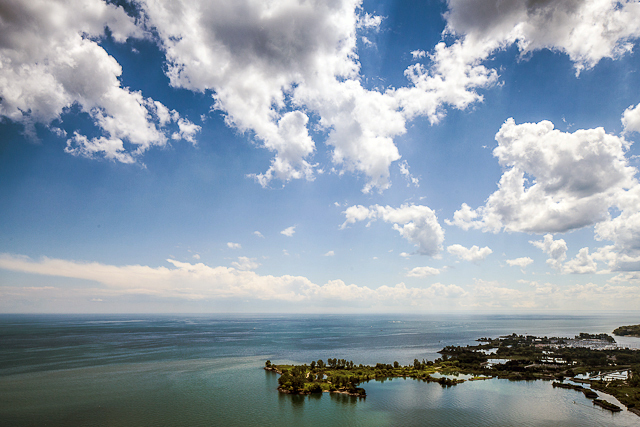 Breathtaking is the word that best describes Palace Place, which is the most prestigious and luxurious waterfront condominium residence in Canada. Suite 3805 is an immaculate condominium residence, with approximately 1,491 square feet of living space and the most enchanting view of Lake Ontario. Click for flyer. 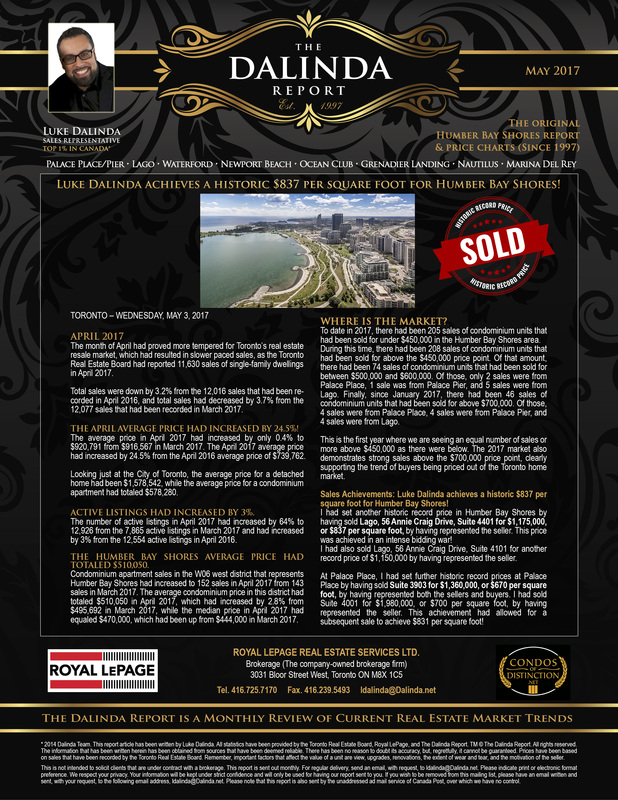 Palace Place: The Dalinda Report, Humber Bay Shores edition, is out now! 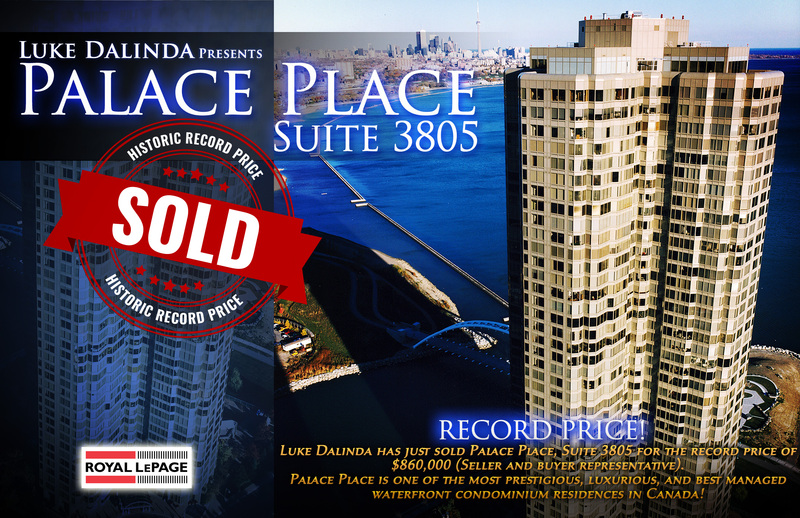 Luke Dalinda achieves a historic $837 per square foot for Humber Bay Shores! 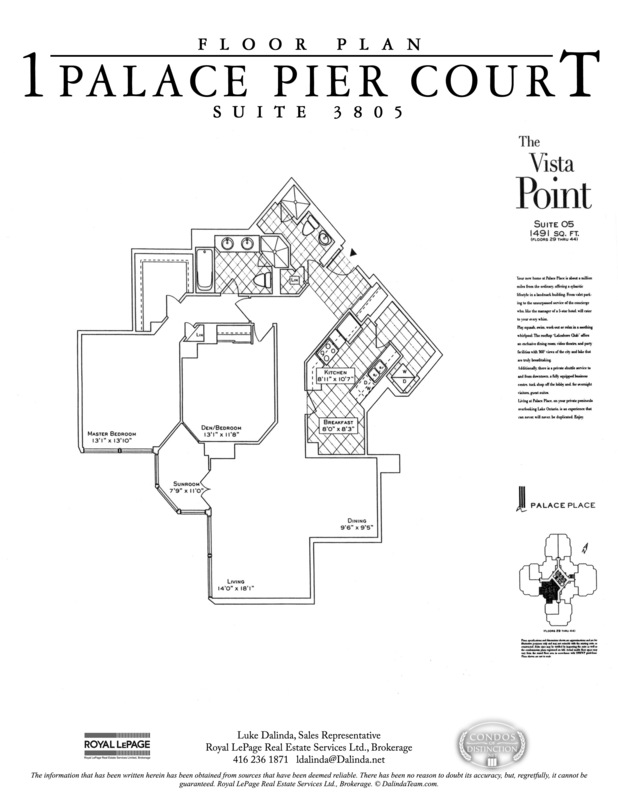 Luke Dalinda had sold Palace Place, Suite 3903 for $1,360,000, or $670 per square foot, by having represented both the sellers and buyers. Price charts for Palace Place, Palace Pier, Lago, Waterford, Newport Beach, Ocean Club, Grenadier Landing, and Nautilus! Critical information for landlords at Palace Place!